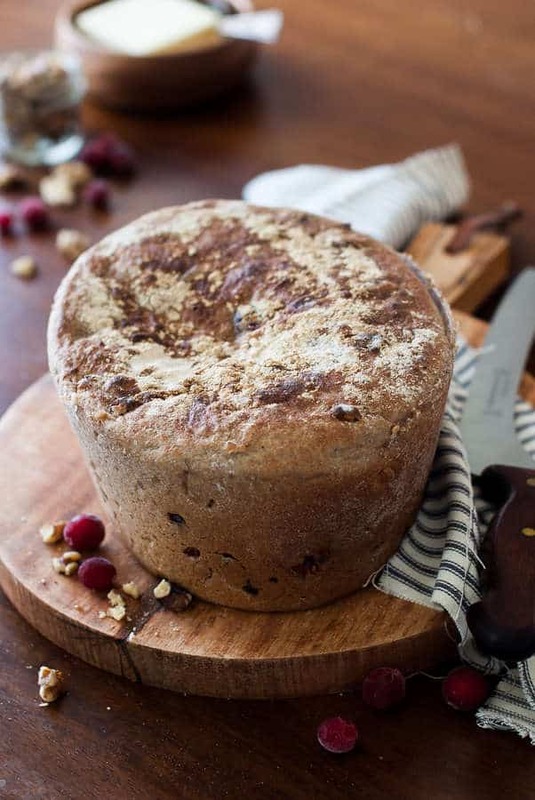 Been looking for a whole wheat crock pot bread recipe? This is a wonderful recipe you can use to make a clean eating whole wheat crock pot bread. Yes, you can make bread in the crock pot instead of a bread maker. This can be a great option for someone who can’t afford a bread machine but already has a slow cooker. It also gives it a different taste than other cooking methods so everyone should try it to see if they like this method. Plus, it won’t heat up your house nearly as much as an oven and it could be a good solution for you if your oven is full already – or if you don’t have an oven. 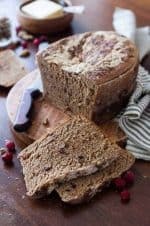 This whole wheat crock pot bread is super easy to make and doesn’t really have much of a rise time. There is a 15 minutes initial rise to activate the yeast, then the ingredients are mixed in, the dough is shaped into an oval (or circle, depending on the shape of your crockpot) and then rises on low heat for about 1/2 hour. After it has doubled in size, the heat is switched to high and left to cook. Easy! I put cranberries and walnuts in this time, to give it a little extra flavor and to give it a more holiday flavor. That’s totally optional though. Do you have any ideas of other mix-ins I should try? I added a little vital wheat gluten to the mix to help bind it. I figured that since it is a plant-based protein it would be ok, but if you aren’t a fan of using it could be omitted. What is your favorite kind of bread? Is there a type of Clean Eating bread you would like me to put on our blog – or a certain kind of flour you want me to use? Comment below and I may pick your suggestion for our next recipe! This whole wheat crock pot bread recipe is ingenious! You let it rise on low and then cook it on high. It cuts down on the total time and is so moist and so good with butter on it while it’s hot! Mix 2 cups of the wheat flour with the yeast in a mixing bowl or bowl of a stand mixer. Pour in the warm water and mix well. Cover and let rise for 15 minutes in a warm area. After 15 minutes, add the vital wheat gluten, salt, butter, coconut oil, honey , cranberries, and walnuts to the bowl and mix in until well combined. Mix in the remaining flour until the dough is just pulling way from the sides. It should be somewhat sticky, but not too sticky to handle. Knead with a stand mixer or by hand for 5 minutes. If you choose to mix by hand, coat you work surface and hands with whole wheat flour to prevent sticking. After 5 minutes of kneading, shape the dough into a circle or oval (depending on the shape of your crock pot) and coat it well with flour. Grease the bowl of your crock pot. Place the round of dough in the crock pot and sprinkle a little more flour over the top of the dough. Place the lid on the crock pot and turn it onto the ‘low’ setting. Let the dough raise for 30 minutes, or until it is doubled in size. Turn the crock pot onto it’s ‘high’ setting and let the bread cook for 45 minutes to 1 hour. The bread will feel firm to the touch on top when it is ready. With hot pads, place just the crock pot bowl (no lid!) in the oven and turn the broiler on high. Let the top of the bread brown for 30 seconds or so, or until you like the color on top (the bread will not gain any color on the top of the loaf by cooking it in the crock pot, just the bottom and sides). Remove and let cool for 5-10 minutes. Remove the loaf from the crock pot bowl and serve! *Store in an airtight container. Will keep for several days. Has anyone tried this, does it really work?